In a short period of 2 years, Street 50 Restaurant and Bar has gained a remarkable reputation over the area of Harbourfront. The restaurant welcomes both tourists and locals, as the food is priced very reasonably. In conjunction of SG50, the unassuming Street 50 Restaurant comes alive with a special Golden Jubillee all-day a la carte menu. This menu will officially debut on 1 August 2015. Read on to find out how you can enjoy a COMPLIMENTARY Veal Cheek Rendang (worth $19.90). The restaurant uses the fresh meat of the snow crab, and thus the dish is on the wetter side. you can obviously see it seasoned with herbs and accompanied by seaweed salad, pickles, wasabi, shoyu pearls and salmon. An exotic mixed seafood flavoured with garlic, bay leaf, and white wine vinegar. Served with a rustic chunk of country bread. ($8.90) A quirky name fits a marvellous dish. Crowned with manila clams, giant octopus, hokkaido scallops and coral garoupa, this dish fits anyone looking for a different twist to your usual Otah in a banana leaf. ($14.90) One of my favourites is this straightforward classic. The bird is the epitome of juiciness and tenderness. Well, I kind of wish this chicken could be a symbol of every relationship! ($19.90) This is a juicy Australian Lamb chop painstakingly marinated in tantalising satay spice, topped with the perennial favourite peanut sauce. ($14.90) This rice vermicelli consists of various ingredients such as the cuttlefish, octopus, Californian manila clams, kang kong, chicken sate lilt, tau pol and a quail egg. The satay sauce is served in a separate sauce pot. ($16.90) It seems that Singaporeans are pretty well-known for being a lover of spiciness. If you fall into that category, go for this gratinated Saba fish topped with a piquant samba onion chutney. Served with Jasmine rice. ($9.90) This dish is definitely worth the price. With generous portion of californian manila clams and escargot, the lettuce is served with a tangy asian achar salad and spicy cincalok dressing. ($19.90) This is definitely my favourite! A dish that is birthed through 8 hours of careful braising and topped with a full-flavoured Rendang sauce, it melts in your mouth like that of an ice-cream. ($18.90) Different textures come to play in this well-executed dish. The garoupa is tender and succulent while the crisp popiah pastry gave a wonderful bite. ($9.90) An aesthetically pleasing dish, the coconut panda foam is peppered with braised yam, sweet potato, pumpkin and Japanese blue potato cubes. It is also combined with rainbow chewy and fizzled with Okinawa black sugar. 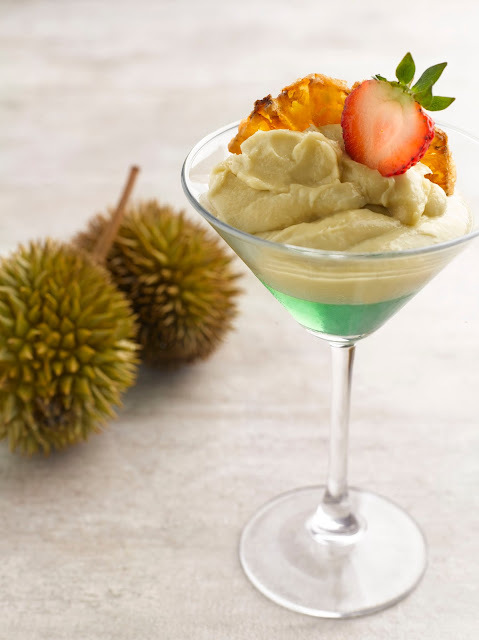 ($8.90) The restaurant has paired the iconic and saporous durian pengat with a fragrant and emerald pandan jelly. 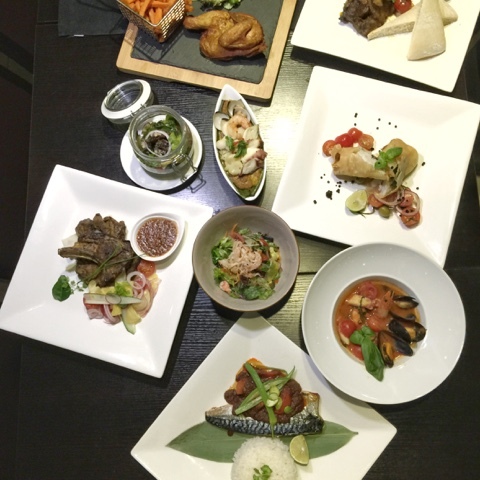 [PROMOTION] Flash this post or simply quote 'littletinysun' to enjoy a COMPLIMENTARY Veal Cheek Rendang with at least THREE main courses ordered.